Black Clover Season One runs from Episode 1 to Episode 50 of the anime, despite it being marketed and represented as one huge show without seasons, like the original Naruto (2002) and Naruto Shippuden anime were. Black Clover is an anime adaptation of a manga by the same name, written by Tabata Yuuki. The show falls under the Shounen, Action, Comedy, Fantasy, Magic genres and began airing on the 3rd of October 2017. When they reach the age of 15, Yuno is bestowed a spectacular Grimoire with a four-leaf clover, while Asta receives nothing. However, soon after, Yuno is attacked by a person named Lebuty, whose main purpose is to obtain Yuno’s Grimoire. Asta tries to fight Lebuty, but he is outmatched. Though without hope and on the brink of defeat, he finds the strength to continue when he hears Yuno’s voice. Unleashing his inner emotions in a rage, Asta receives a five-leaf clover Grimoire, a “Black Clover” giving him enough power to defeat Lebuty. A few days later, the two friends head out into the world, both seeking the same goal—to become the Wizard King! As always I would like to put a small disclaimer here. These are all my opinions and views on Black Clover, I am in no way opposing any views anyone else may have about this anime series. With that out of the way, let’s begin. Black Clover gives me chills. The anime itself has some incredible moments that have the same resonance you got from the Naruto Vs Pain fight or the All Might Vs All For One fights in Naruto Shippuden and BNHA respectively. The lead of this show, Asta feels awfully similar Hinata Shoyo from Haikyuu! and also feels like the offspring of Uzumaki Naruto and Midoriya Izuku. The story is the second weakest part of Black Clover, and despite that, it’s good enough for me to give it an 8 out of 10. It is a simplistic yet complex story that draws you in and makes you invested in the world that the anime creates. As you watch the show you begin to fall in sync with what’s happening and you find yourself rooting for our protagonist and becoming invested in the story this show has to tell. It’s amazing how much can be accomplished when you just take two boys with the same dream and throw them into an expansive, developed and fleshed out world, with different kingdoms and classes of operatives, alongside a third-party group that is working to change the world. Sounds very similar to Naruto but hey, who said that’s a bad thing. Black Clover does an incredible job in storytelling. The world is excellently developed and fleshed out so far and the way in which society and the world works is explained thoroughly. I can’t go more in-depth without spoiling, unfortunately. The characters are insane. Each individual character is given such detail and attention it feels like I’m re-reading Lord Of The Rings. Every side character you come to love, every villain you come to despise yet love at the same time, and the main leads are just as developed as everyone else, creating a sense that the show isn’t just about one or two people, but about the grander scheme of things, which only adds to the world building. I didn’t expect to know Magna’s backstory, or to love Luck as much as I do. I didn’t think that the Wizard King would play such a large role or that Captain Yami would grow so much alongside the others. I didn’t expect to feel pain at the death of a character that we’d known for less than 15 minutes, yet I did, because he played such a role in other’s stories, that I felt the pain. Our lead Asta has a clear-cut goal, to never give up and become the wizard king. The show doesn’t let us forget that, or that Yuno is the same. Speaking of Yuno, the dynamics of the relationship between Asta and Yuno are so magnificent that no matter where they are or how different they are, the other is still their rival and best friend/brother. Asta, as previously mentioned, feels like a huge combo of three of my favourite characters, Naruto, Deku, and Hinata (Haikyu not Naruto). The blend comes out perfectly, and a brand new character emerged. He is an interesting fellow, and one you will find yourself rooting for no matter what decisions he makes. Speaking of relationships between characters now, I believe it’s evident that just seeing a side character in another side character’s backstory made them thoroughly developed. This shows the amount of characterization, character building and relationship development that went into the show. The writing was phenomenal and paid off in a way that you rarely see. In total the characters and their relationships are flawless for me. The score is where Black Clover falls short. Let’s talk about the good first. During the fight scenes the anime has an incredible score that goes perfectly with the dynamics of the fight. The music feels synced up to how the characters are moving in the fight. The battle score adds wholeheartedly to the action sequences and makes them more enjoyable to experience. Another plus point is for the Underwater Temple music. The one that Kahono sings. It’s a melancholic and beautiful track which really brings out her emotions about her dreams and her brother’s too. The other songs in her library of song magic which we get to see have variety of sounds, each one not entirely unique in its own sense but different enough. The final song that the people sing as the Black Bulls leave the Underwater Temple is also magnificent. Now onto the bad part. Black Clover has had a couple OP’s already by the time you get to episode 50. Unfortunately, none of them are very good. I find myself skipping each OP that they throw at me. The OP before an episode starts is really what gets me excited for the next 20 minutes of the show and it’s a shame that Black Clover was unable to get good OP’s or Endings because I know how much my viewing experience of BNHA was impacted by Peace Sign and Sora Ni Utaeba and how much more excited I was for Haikyuu! after Believer, Fly High and Hikari Are. Edit (23/11/18): After listening to the OP’s once more I am going to amend my statement. In my opinion OP 1 and 3 are actually pretty damn good. They do provide the hype build up well and the clips that the studio synced with it does create the effect of dynamic action that you want from an OP. OP’s 2 and 4 are still forgettable for me and I will not be amending my statement on them. However part of my argument still stands, they do not reach the level of the examples I put in the previous paragraph. The animation quality in Black Clover is great, but it’s just not reached it’s best. The regular animation through the show is consistent and pleasing, giving a sort of historical and medieval look to the world, which I love however it’s the fight scene animation that I believe could be better. Don’t get me wrong, as it is now, the fight sequences hit a pretty high bar, one that I did not expect to see when I started the show. The last big fight that happened in S1 gave me as much excitement and as many shivers as Deku Vs Muscular and Naruto Vs Pain. Although the dynamic fight scene animation is great it can be a lot better. The movements can still look clunky in a few places and it still lacks the ability to show how strenuous of a task fighting a certain opponent was. Only a few of the actual attacks and movements come off with their full potential whereas the others feel underwhelming and just irrelevant. I hate this because it also slightly breaks the tension and interrupts the flow of the atmosphere that the intense fighting created. If each part of the fight was given more importance, detail and felt like it mattered it would be a lot better. Black Clover is a thoroughly fun show to watch with a few holes here and there. However, they aren’t significant enough to talk about. The show as whole gets you hooked and refuses to let go. I found myself laughing, smiling and getting shivers quite a lot and I enjoyed the excitement. A few episodes here and there feel drawn out which broke my excitement for me but the show got back on track one or two episodes later. 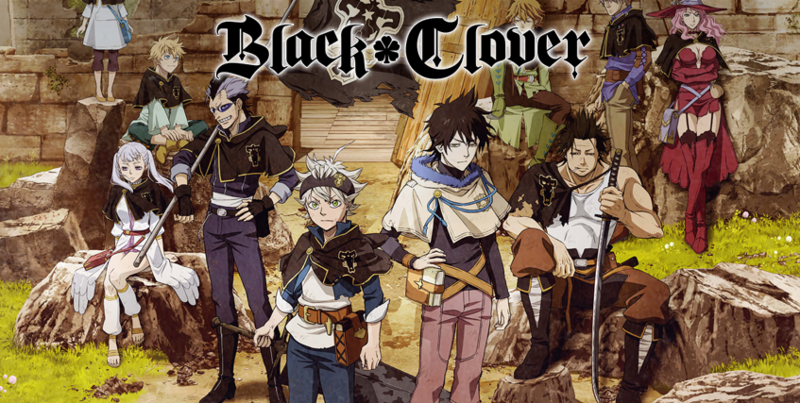 Black Clover is a great show that I would heavily recommend to fans of the Shounen genre and of shows like Naruto, Dragonball Z, Boku No Hero Academia and Nanatsu No Taizai. However, if you aren’t a huge shounen fan I would hold off on watching Black Clover in case you have something to watch that is more suited to your tastes, although I would recommend you watch it too when you have time, as it is a great show. Only thing that I disagree with is the openings, because, in my opinion, OP 1, OP 3 and OP 4 are bangers. Other than that I liked how positive this review is!! Thanks! I’ll take a listen again and update the review if I agree, I may have missed it’s greatness, wouldn’t be the first time something like that happened. I truly love your website.. Very nice colors & theme. Did you build this website yourself? Please reply back as I’m attempting to create my own site and would like to learn where you got this from or exactly what the theme is called. Kudos!